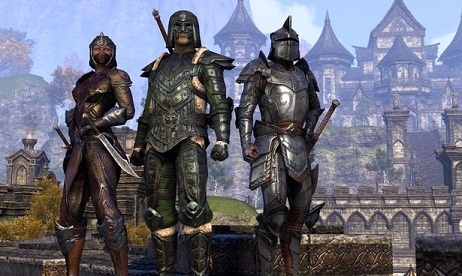 The beginners guide for The Elder Scrolls Online - Tamriel Unlimited (ESOTU) for PS4 /Xbox is still under construction and will be expanded in the coming days. If content is missing, simply looks again later. - For normal attack you need the keys R2 and RT (Xbox) - when the trigger taps briefly - a slight attack carried out and if you keep the button pressed - a serious assault carried out. - You can block with all weapons, even with the longsword. The best course is the sign - Each block consumes stamina. Blocking is generally more advisable for example block off a severe attack of the enemy, this is for a short time out of balance - which of course allows a quick counter-attack, which then also applies. - These buttons can occupied with active skills. / You have these skills but it will activate; Endurance points consumed. - The ability can be used immediately when you have assigned to the keys. If the ability is used you have to fight it through recharge, the icon will again "brighter". - If your opponent "red lights" then he's out looking for trouble and attack - and then he is going to attack and you have the chance to interrupt his attack for a brief moment. - R2 or with the Xbox - the right analogue stick press. Then pay attention to the faded eye, it is closed, so camouflaged since you and when it opens, since to be discovered going and have to hide you. - Death announces itself when it flick red in your field of vision, that is to say - your life points reach a dangerously low level. - The first is a revival closest. - Or you use a Soulstone and revive right at the place of your death again. You should always have enough Soulstones with you when you don’t want to walk back all the way again. - Tip: Soulstones you or another player to revive, you may be able to buy from a dealer or refer to the game (in chests; at opponents; in capitals) - unfortunately are charged stones expensive (empty stones are cheaper) - If you have learned the skill "Soul Trap", so you can save yourself the money and charge the stones yourselves - So just buy empty stones! - Of course you can also let you revive a teammate. Note: The soul stone must have the appropriate level of the late character. - In Tamriel all new quests waiting for you, if a quest is available, it appears above the head of the quest giver. (Easy to address and it starts). - The quest givers are not always to be found in the same place, they are around. With successful completion of a mission, don’t leave the scene immediately. - When you open the main menu you can always overlook your "active quests". For this you just need to open the diary, you can select the quest and set the focus on - then it will appear in the compass and you can find the quest easily. - A predetermined Quest sequence there are at "ESOTU" a quest does not lead to another. So you have to explore the game world and can choose your quests. Here you can come across hidden places or lead to information about these places. - All Quests can be shared with your group members. - Skull white markers indicate the location of bosses. Bosses respawn very quickly and with repeated killing - they sometimes let fall special items (Soulstones example). However, the quality of loot does not improve. - Most games now have a quick trip function; in Tamriel can use its that bring you quickly from one place to another. - Wayshrines be activated when you approach it, you can at any time on or Options (Ps4) touchpad to select a wayshrines the you have already used, this is free. - Wayshrines which you have not discovered themselves, and which are only visible in the map, they must first be unlocked for a fee. - A horse you can buy in a city or in the crown shop. Prices for horses start at 17,000 gold pieces. A horse is practically with him you can move you faster up to 15%. - A horse can be summoned any time and it is unlocked for each character on your account. The horse call via the touchpad or the Option key (Xbox). - Of course, not as easy to ride, you should also take the stable, then you notice a riding attack easier or a quicker ride. This ability must educate only one character. - You can perform a sprint gallop with a horse. If your hay fed, then the endurance increases with time. Apple make the horse over time a few percent faster and with oats can carry larger loads. After you've broken through your brief in Tamriel, it is necessary to equip collected objects or to compare them with other objects. - Lower other options you will find also the Quick Access. For the fight you can put yourselves suitable goods in fast access, it can be occupied again at any time using the + Control Pad, simply select pad "above". - Of course you can also use objects when traveling merchants or buy in a store, here you have then the opportunity to repair or sell the items. If you accidentally sell an item, but there is always the possibility of a quick surrender. For "Move" you can buy also repair equipment, then you don’t have back in a store. Unfortunately build your equipment over time to life and can not be repaired indefinitely. - You will receive per account banking specialist, then you have to go only to a banker and have access. - All characters within an account share a bank specialist. - About the Bank specialist you have access to all craft materials. - In Tamriel can be found in the wild certain raw materials; for example, mineral deposits and various other materials. If you come across such resources you have just Cross or A (Xbox) press dismantle them. Of course, can also be found in cities materials, you have to keep only filled crates or barrels out. - To produce something you have to see a craft table, on an anvil can be forged, for example. (For each profession there is a suitable craft table). - Material: Mushrooms; Plants; Flowers and other ingredients. - Your goal is to invent potions with certain characteristics. - For the Alchemist must now combine reagents which have at least one common characteristic. Ie you have to decipher various reagents to learn their properties these are mixed with solvents, and then invent certain potion. So diverse experiments are needed. You need at least 2 reagents. - Note: Solvent strength and influence stage of the potion and have to drink production necessary. - The Alchemist can also some specialized "Passive Skills learn". - Material: caterers (such as cooks or Brauer) can prepare simple meals natural or potions, but recipes are needed and a fire pit and of course the ingredients. Ingredients found in crates, barrels or bags. Note: ingredients can also be contained in objects. - Enchanter combines runes to glyphs, which are then used in Gege stalls and give them certain attributes. So can you powerful items and weapons production, make you dangerous. - Material: The resources are 3 different rune types that are scattered in Tamriel and need not be manufactured. - For the production of equipment such as weapons and armor raw materials are needed. The nature of the material determines the level of the weapon (for example) - but every nation has different styles in shape and appearance of the equipment. Go all "objects can be improved. This is done by an analysis on. 'Respective crafts table," the characteristics of the object to be detected, the more properties you have learned it, the faster: "For below 3 trades gilt". Then you can also destroy the object thus can you for example take advantage of existing objects (reuse). - Quality improvement: The higher the quality of an object the more raw materials required to improve the quality. Improvements can be achieved with resin, tannins or "curing agents". - Blacksmith: Can metal mild to severe Arms and Armor. A blacksmith can produce weapons only in the style of its own breed at the beginning. To have "styles" tiling around other breeds, only the skills need to be improved. - Carpenter: Make wooden weapons forth different, eg shields. In the game you can collect up to 8 types of wood, as well as the blacksmith he can produce only arms in the style of their own race at the start, later styles of other races can be used. For each additional type of wood to be processed, an additional skill point to be invested. - Tailor: Can of leather (from animals and enemies) and fabric remnants (found throughout Tamriel) produce light and medium armor. Thus leather or fabrics can be processed, must invest their skills points. Even the carpenter may initially produce only armor in the style of their own race, later styles of other races can be used. Apart from that your product range in the crown shop has grown, the altered Champion System must be emphasized especially. - You can watch if you have reached the level 50 - the Champion System unlock. Only from this point can your character to earn points champion. (After defeating Molag Bal). - This gives you an extra skill points (Champion points) that can be invested immediately into various "passive skills". - Importantly: The deserved Champion points belong to your account, no matter who has earned it each character of the account they can use. - If you now the main campaign of your own faction have finished, you can watch pleasure in veterans zones formerly that was very difficult to equip the character with other skills and to achieve a higher level but it is now Champion points. - This you can use in group challenges earn or at 1 & 1 fighting in the Dragonstone Arena. - You can move through the honest world of Tamriel, but there is also the opportunity to go into the world of crime and one or two good steal. - But if you are caught, then a bounty will be exposed to your character. From this point guards will be attentive in cities around you, and they ask for a the bounties. - Otherwise, you can the stolen goods in "Lawless shelters" sell and pay bounties.